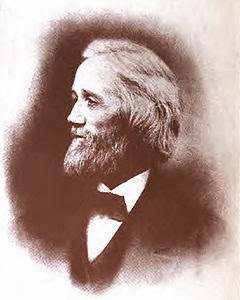 Christopher Latham Sholes (February 14, 1819 - February 17, 1890) was an American inventor who invented the practical typewriter and the first QWERTY keyboard still in use today. He is also a publisher of Wisconsin newspapers and politicians. Christopher Sholes Born in Mooresburg, Pennsylvania February 14, 1819. Sholes moved to nearby Danville, Pennsylvania and worked there for an apprenticeship at the press. Upon completion of his apprenticeship, Sholes moved to Milwaukee, Wisconsin in 1837. He became a publisher of newspapers and politicians as Senate in the State of Wisconsin (1848-1849) as Democrat, in the Wisconsin State Assembly (1852-1853) as Free Soiler, and as Republican Senate (1856-1857). He was instrumental in the successful movement of abolishing the death penalty in Wisconsin: his newspaper, The Kenosha Telegraph, reported at the trial of John McCaffary in 1851, and then in 1853 he led a campaign in the Wisconsin State Assembly. He is the younger brother of Charles Sholes (1816-1867) who is also a newspaper publisher and politician who served in both the Wisconsin State Legislative assemblies and as mayor of Kenosha. The first commercially successful typewriter was created by C. Latham Sholes, Carlos Glidden and Samuel W. Soule in 1867. The invention was later acquired a patent and purchased by E. Remington and Sons, a manufacturing company. However, this machine initially still has some deficiencies such as clerks can not see the results of direct typing and the difficulty will be the placement of keys used to return to its original position. This can then be overcome by the emergence of "visible typewriters" such as the Oliver typewriter in 1895. The "qwerty" layout on the keyboard has become standardized and is still in use today. 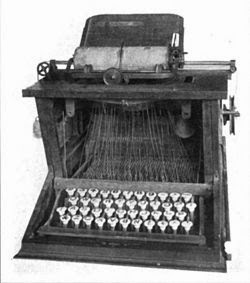 In 1874, Sholes and Glidden created a typewriter with a "qwerty" keyboard layout. This layout has become standard in English typewriters and computer keyboard. Type "qwerty" adjusted in some other countries, such as "qzerty" in Italy, "azerty" in France, and "qwertz" in Germany. This layout is considered less efficient because it slows down the scribe in typing. However, this kind of layout can reduce the typebar frequencies that block and jam on the machine. Then there came a number of proposals about a radical layout, like "Dvorak", but nobody was able to replace "qwerty". The "Blickebsderfer" typewriter with "Dhiatensor" layout has the possibility of being the first attempt to optimize engine layout layout for efficiency gains. QWERTY is one type of keyboard layout layout. Named so because the letters Q, W, E, R, T, and Y are in sequence as shown in the top row of this keyboard (ie used on most current computer keyboards). 0 Response to "Who Invented The QWERTY Type Machine? History Of QWERTY Type Machine - Biography of Christopher Latham Sholes"